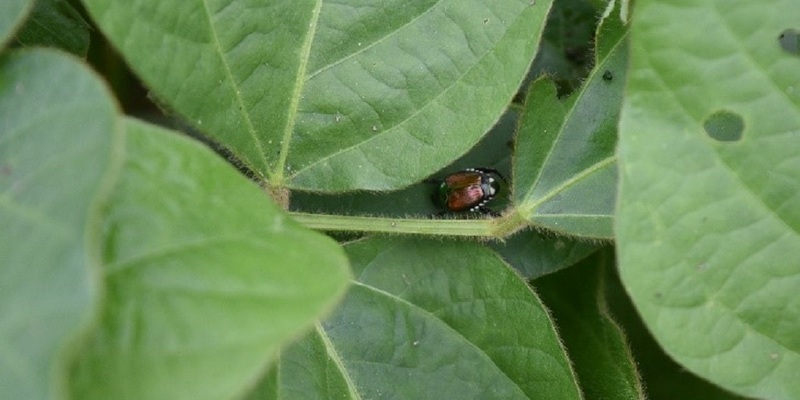 A Japanese beetle is spotted on a soybean leaf in Kinston, NC. As growers and retailers walked the soybean weed management trials at the Kinston, NC, Grow MoreTM Experience site last week, it was clear that insects were also becoming a problem. Japanese beetles and grasshoppers were found among soybean leaves as attendees walked by. The adult Japanese beetle is about a half-inch long, metallic-green with bronze-colored wing covers. These beetles overwinter and emerge in late June through early September. They lay eggs, which usually hatch in July and August. The beetles feed on the soft leaf tissue, leaving behind a “skeleton” leaf. Adults are highly mobile and have been known to reinfest fields, so continue scouting even after a population has been knocked down. Young grasshoppers were also spotted in the soybean trials. Temperatures in the area have been warm and dry for weeks, which are perfect weather conditions for grasshopper infestation. These pests show up in fields in July and August, lay eggs, and overwinter. They mostly feed on soybean leaves but can occasionally feed on pods, chewing through the pod tissue into the seed, which can result in severe yield loss. Because these soybean trials were intended to show the benefits of pre- and post-emergence herbicides, insecticides were not applied, as foliage-feeding insects are not at their threshold yet. If soybean insect pests like Japanese beetles, grasshoppers or kudzu bugs are present in your fields, we recommend Endigo® ZC insecticide. It combines 3 industry-leading technologies for quick knockdown and extended residual control of key foliar insects, resulting in higher yield potential.